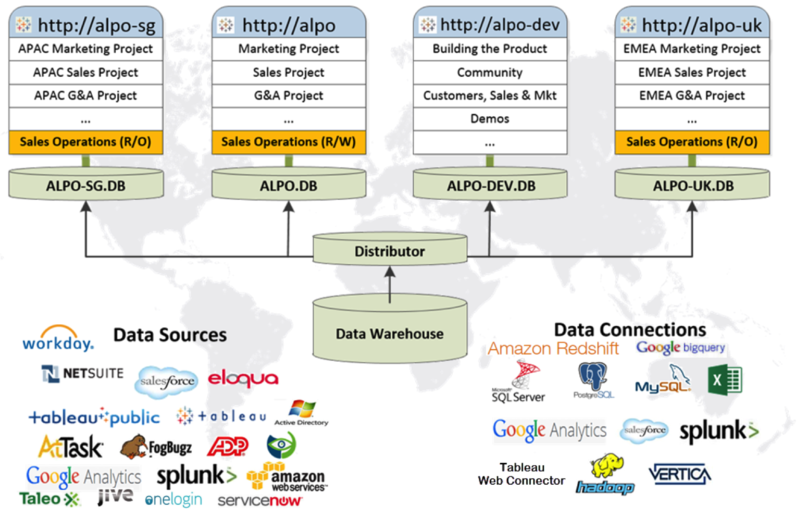 Why should IT organizations promote a culture of self-service analytics? The answer is simple: productivity. Our job in IT is to create a secure environment that allows people to be highly productive. And enabling people to explore their own data in real-time is an essential part of that work. Here at Tableau, our strategy starts with an analytics team that lives within IT. Our analysts don’t write reports; instead, they help other people see and understand their data. The team provides vetted data sources in a secure environment. Then, using that data, people across the organization conduct their own analysis and share their findings. If people need help during their analysis, they can always turn to the analytics team—through our internal enablement platform and at weekly Tableau Doctor sessions. The whole idea is to build a culture of analytics through people, processes, and technology. Part of this culture is integration. We use Tableau to connect to data in systems across the organization like Splunk, Salesforce, and ServiceNow. We then embed relevant dashboards on internal wikis, forums, and even back in Salesforce—places where we know people already spend their time. This modern approach to enterprise analytics not only frees up IT to take on a more strategic role but also helps the business react more quickly. The more questions people ask, the more value they extract from the data to ultimately benefit our customers. Our IT department fully subscribes to this approach because we’ve experienced the power of self-service analytics firsthand. We know what it’s like for business users to discover key insights because we’re having our own aha moments. 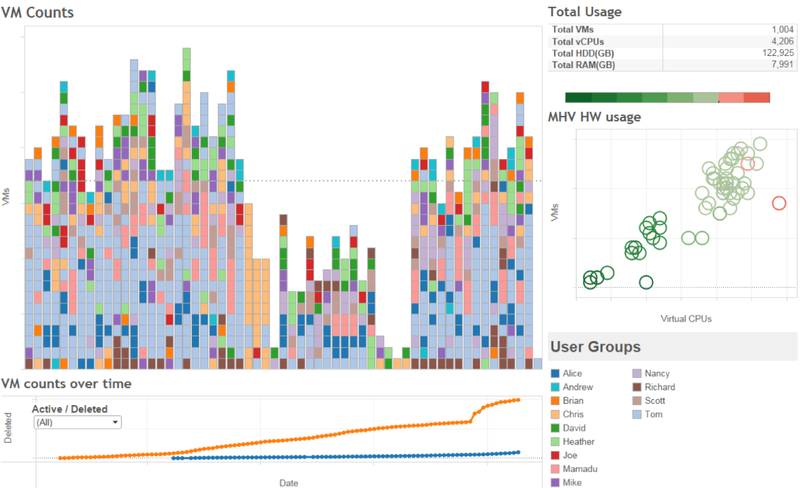 We recently learned something unexpected when an IT team member pulled our VPN usage data into Tableau. With just a few minutes of drag-and-drop exploration, Jeff found that nearly half of our users in Europe were connecting via the data center in the US instead of their local one in Europe. Those users were connecting across an ocean, meaning they were waiting longer than necessary for the connection. Definitely not efficient. This issue was impacting quite a few of our users and made our service appear slow, yet it may have gone unresolved without the right tool. Seeing the data visualized on a map prompted the person to ask more questions that eventually led to the finding. 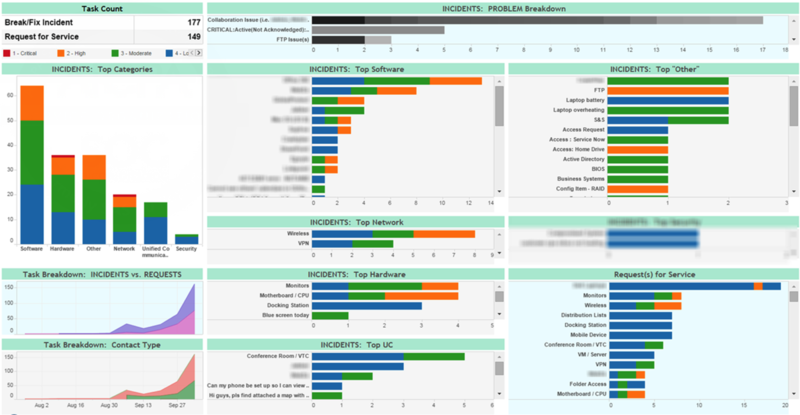 I myself spend an hour or two each day exploring various dashboards. 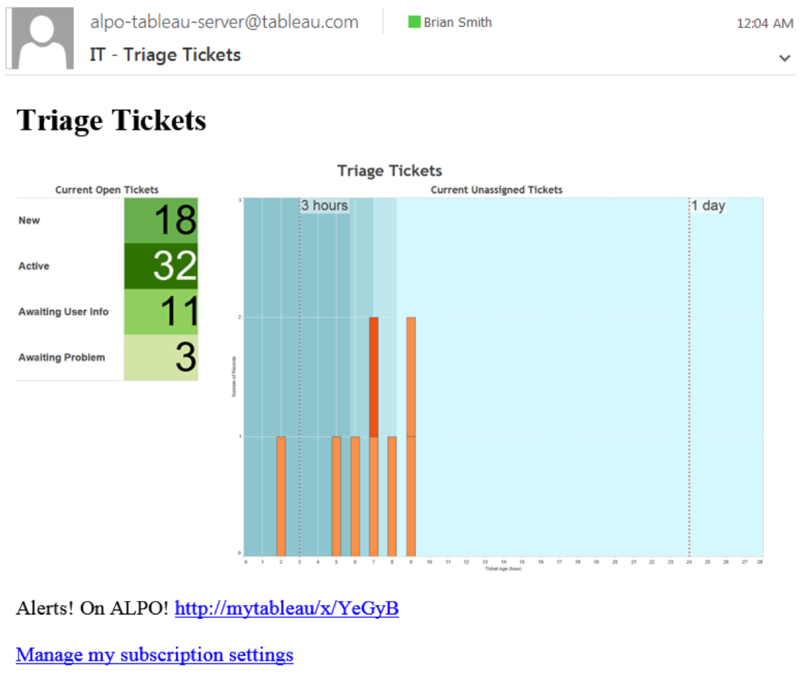 I start the day with email alerts from the various dashboards I subscribe to on ALPO, our internal name for Tableau Server. These dashboards pull in data from systems like ServiceNow, Salesforce, NetSuite, and Workfront, to name a few. These reports provide a pulse check of projects and technologies across the organization: What does the IT ticket-triage queue look like at this moment? What are the current support-response times across geographies? Which office is seeing an influx of reported issues? What temperature are our data centers across the world? These email alerts let me know when something will require my team’s and my immediate attention. Then there are the dashboards I use to ask deeper questions of my data: Where are we spending money, and how should I plan my budget? 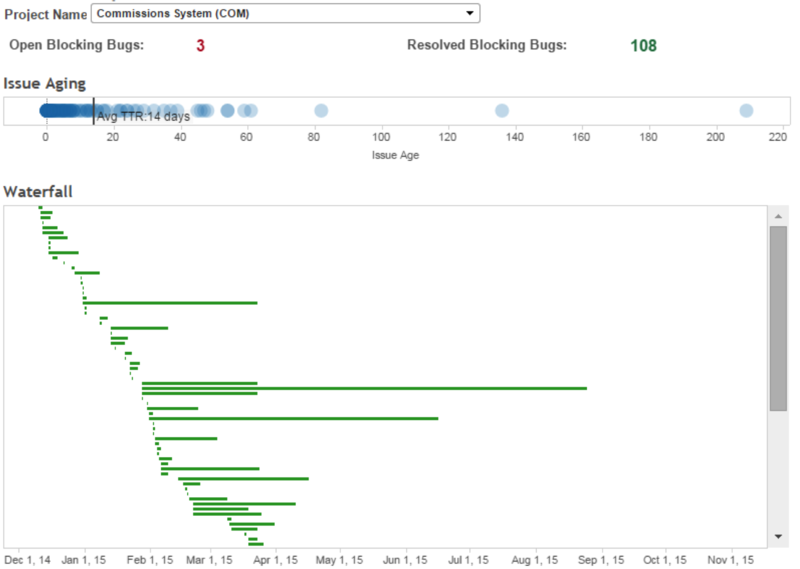 How active is our ticket-triage list, and are there any indications of a systemic problem? What’s our backlog of bugs, and how long have those tickets been open? I can uncover my own insights, and I know my colleagues across the organization—in marketing, sales, development, and, of course, operations—can do the same. Investing in a culture of self-service analytics takes time, people, resources, and education. But the benefits far outweigh the costs. There are plenty of tools that provide the business with generic reports. But these only answer the foreseen questions; they don’t empower the business to spot opportunities, solve problems, and gain a competitive advantage. True self-service analytics helps the business see and understand its data when it matters most. And when IT empowers the entire organization to explore data in a safe, governed environment, IT becomes a partner in the business. And as partners, IT and the business grow a culture of curiosity that fuels innovation, engagement, and success in the marketplace. To learn more about how we leverage self-service analytics to maximize business impact, check out our upcoming How We Do Data webinar series. We're also offering the sessions in Europe-friendly times. Click here for that schedule. If you haven't yet, take Tableau Server for a free spin. We are just getting started with Tableau and hope to build a culture of self-service analytics in our organization. Currently our team has a couple of Tableau desktop licenses and we are trying to drive adoption by creating visualizations for our users to consume with Tableau Reader. If we get enough adoption, we will purchase a handful of licenses for a small Tableau Server installation for demonstration purposes. At that point, we will de-centralize our services and shift from being report providers to being reporting enablers. We will publish curated data sources and encourage teams within our organization to purchase their own Server licenses and create their own visualizations using Tableau Server. 1) Why does our group have to purchase server licenses when your group could just create the report for us? 2) Okay, if I buy a server license, how do I pull my own data into Tableau Server without using the curated data sources you guys set up? So how do we best solve this problem? Getting teams to purchase Tableau Server licenses will already be a tough sell. I realize question #2 could be answered with Tableau Desktop, but asking teams to purchase two separate products is just not going to happen. Can we do it with just Tableau Server?